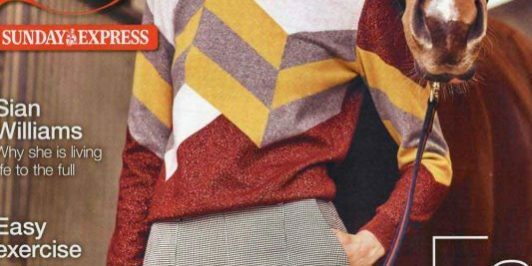 As seen on the front cover of S Magazine, the Edin lurex hand intarsia jumper. What an incredible fashion editorial set at the Newmarket Races. The Edin is knitted in the Scottish Borders by a highly skilled hand intarsia knitter, taking up to 8 hours to knit the front panel and sleeves. Knitted in the finest blend of merino cashmere with a golden lamé twist.